I enjoyed when there were weekly decorating contests which you could submit through the game because I loved looking back at everyone's old entries. my favorite yo-memory... Jan 01,2013. Celebrating our 1st anniv in yo. thanks a lot BVG for helping us to continue this awesome game and keep the love alive. I have good and some bad yo-memories, and I cherish them all! I remember buying my first house in the game. It was the 10k Ranch House. I was so excited about it! My all time favourite memories in Yo was making 'music video's' with friends, took forever, but everyone had fun doing it! Ah well, this is a rather personal one. I started playing the game years ago and invited a best friend to try it. Where I don't particularly get into the social aspect or all the bells and whistles Yo has to offer, she jumped in full on and it became one of her all time favorite games. Social, events, trading, clubs...everything. We joked all the time about her Yoville addiction. Then she got sick...and passed away a year and a half ago. Recently, I came back to play after being away for two years. There are a lot of memories here. It is a tangible reality that the little things can bring a large amount of heartache but given enough time it can also bring indescribable and cherished memories. My favorite one is the day I came back. Looking at all the stuff in the stores that were new to me but I was thinking the whole time oh well, that is hideous...of course she would buy it. She would definitely get this, or get that. There is a contest going on, she would convince me to enter with her. It was a reminder that she really enjoyed it here, and of course, it made me miss her. HERES TO ANOTHER YEAR! CHEERS!! I actually have two memories that stand out for me. The first one is the weekend when there were no ninjas on duty and everyone was able to post...for the first time, ever...a picture of themselves so that we could all see what each other looked like in real life. It was incredible how many posted. The posts were quickly taken down on the following Monday. My second great memory was when my friends (who unfortunately, no longer play) and I raced for a month in July '10 to see who could reach the top level first. We seemed to play the game around the clock! My first big memory in the game is when I was still really new. I had been playing for a bit and decided to leave my house for the first time. (Up until that point, my yo had never left her home, not even for shopping. lol) I wandered for a bit and was blown away by how much was outside my Yo-door. Some guy started following me from place to place and I was going to go home when he asked me what I was doing. I explained and he busted out laughing. (First time I had seen an action used or a sticker.) He gave me a bunch of tips, buddy listed me and told me to follow him. I did (my first follow) and we were at an event (also my first). He went to the owner and started a trade. I guess he wanted to talk in private without me being able to see. They ended the trade and the owner told me to pick anything that I wanted from their home and I could have it. I kind of refused the offer because it was so unexpected and I had just met them. I didn't want to seem greedy or anything. After a bit, they talked me into it. I walked around and there was so many awesome things. I finally came across a frame that had a few hair pictures in it. I commented the red was beautiful and kept looking in the room. I finally chose a racecar bed. The owner was like all of this and you choose one of the cheapest things here. I told them I just thought it was cute, I don't know about prices. The owner said she gifted me the bed and my new guy friend asked me to trade, he had another bed like that I could have. I accepted the trade and he put the bed in and 1 million coins and asked me to trade him a chest. I was so shocked because I barely had 20k in coins. lol. We ended the trade and after a bit of conversation, I headed home. I got home and looked in my guestbook. Not only did the event owner gift me the bed but she had gifted me a ton of additional stuff, including the red hair that I had commented about on the frame. I was so amazed by their generosity and kindness. It really showed me that Yo was a community and that is what really hooked me into the game. When I first started playing YoWorld my friend also started. We would gift each other all the time. Then we thought why not meet in a store and shop together. So that is what we did. We would shop and buy each other things we really wanted. I bought her a hot tub so we would get on our bathing suits and go to her apartment and get in the hot tub with drinks and sit and chat. That is my fondest memory of good times in YoWorld. So many great memories but I think the best was wearing the barrel costume to protest the sweats factory in front of Alton towers! So many people played then including my daughters, son and spouse. I still visit them even though they no longer play. My sons ex, who was a huge yoville fan,hacked his account and took everything Including the dog with the zynga shirt on and all his medieval furniture.! Too many great memories! I do miss getting yo cash for completing the sponsor questionaires. You had to get to the end to get your yocash but the trick was to do it without signing up for anything. I also miss actually walking from place to place in yoville Instead of just teleporting. Thank you BVG for developing this game and for buying it back when zynga was ready to throw in the towel. I have so many memories with Yo. I've been playing since I was 12 years old (I'm now 19 and a Sophomore in college). I basically grew up with this game. Over my 7 years of playing I've had so much fun. I've met so many wonderful people from all over the world. This game provides a platform to escape your everyday life, and I'm so grateful to have it. 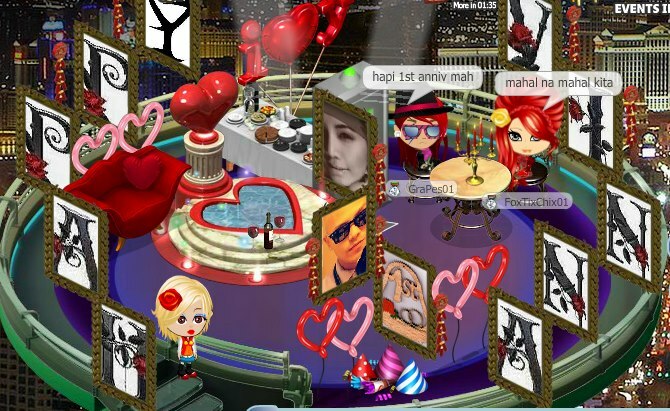 I remember when Zynga cut ties to Yoville and I was heartbroken. I thought all was lost. Until BVG came to the rescue! Thanks so much for the hard work you all put into this game. Happy Anniversary YoWorld! THANKS TO MY YOANGELS! You guys are so amazing! I remember when me and my friends hanging and talking about silly jokes, and when i feel that i really having fun when decorating ! I really wanna show you my decorating skills! I remember my first Item I bought when i first started playing in 09.It was a chair lol. I Have met people from all over the world. Meeting the friends I have now was the best. I want to thank you all making that possible. THANK YOU AGAIN FOR ALL YOU DO! !